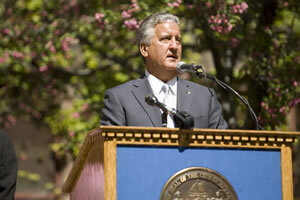 Albany Roundtable: Mayor Jennings - DATE CHANGE - Thu. Jan 10! Mayor Jennings - DATE CHANGE - Thu. Jan 10! ALBANY, NY – December 12, 2012 – Albany Mayor Jerry Jennings will address the first Albany Roundtable luncheon of 2013 on THURSDAY, January 10. The Roundtable usually meets on the second Wednesday of the month, but the date was changed to avoid a conflict with Governor Cuomo’s State of the State address. Albany Roundtable luncheon meetings are held at the National Register-listed University Club, 141 Washington Avenue at Dove Street in Albany, and are open to the public. Mayor Gerald D. Jennings was elected the 74th Mayor of the City of Albany in 1993. Born in North Albany, Jennings had a 21-year career as a teacher and high school administrator for the Albany City School District and served 13 years on the Albany Common Council representing the 11th Ward. The Mayor has successfully established collaborative partnerships with New York State, the business community, educational institutions, and nonprofit organizations that have produced new development projects representing more than $6 billion in new investment since 1994. The Mayor will discuss the recently announced Local Waterfront Revitalization Program (LWRP) undertaken to discuss the future of Albany’s waterfront as well as a number of other important developments in the city of Albany. The cost for the luncheon is $20, which may be paid at the door. The Roundtable is also offering its guests the option of paying in advance with a credit card at www.albanyroundtable.com. The University Club will serve a hot and cold buffet from 12:00 noon to 1:00 p.m., with the program commencing at 12:30. Reservations for the January 10 luncheon are required by Monday, January 7 and may be made by prepaying online, by calling 518-431-1400 (the Albany Colonie Regional Chamber of Commerce) or by sending an e-mail to albanyroundtable@yahoo.com.